Vertical cutting dryer is a new design and product of drilling waste management system. DCTLL-A vertical drilling cutting dryer is a kind of separation equipment which utilizes mechanical rotary produce centrifugal force to realize. Drill cuttings are conveyed from the shakers to the VERTI-G cuttings dryer through a variety of site-engineered conveyance systems. Maintained by programmable logic control (PLC), the flow of cuttings into the VERTI-G dryer is continuously fed to yield optimal liquid/solids separation. The VERTI-G cuttings dryer incorporates a high-speed vertical centrifuge that achieves maximum liquid/solid separation in large-volume processing. This mechanism makes the VERTI-G dryer one of the industry’s best performing and most dependable cutting dryers. Available in both standard size and compact configuration. The VERTI-G cuttings dryer improves overall cost efficiency by recovering costly drilling fluid that is recovered from cuttings, as well as whole mud lost from shaker failure and rig motion. 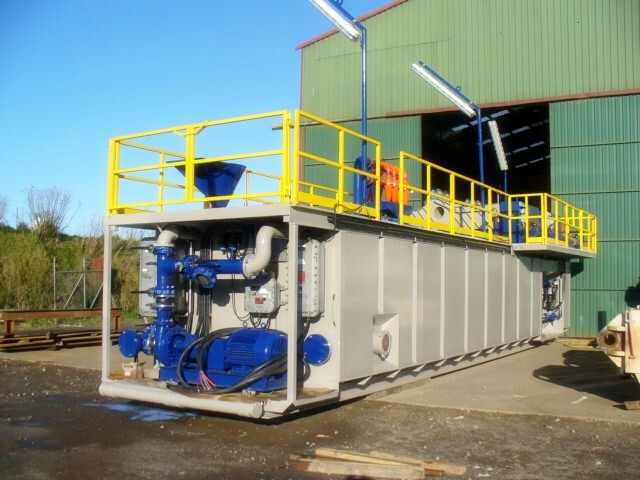 Further, the VERTI-G cuttings dryer produces lower waste volumes by generating dryer solids in both oil- and synthetic-base drilling fluid systems. Reducing waste volume helps to dramatically reduce disposal costs. DC Company finished the production of diesel tank for Poland clients and prepared to delivery to XinGang Port. Oil tank is the major corollary equipment in oilfield drilling rig, it is mainly used to store and provide fuel to generator set. The oil tank designed and produced by our company is easy and convenient to use and maintain. This time we manufactured the oil tank strictly accord to users request, including wall thickness, paint standard and American steel. 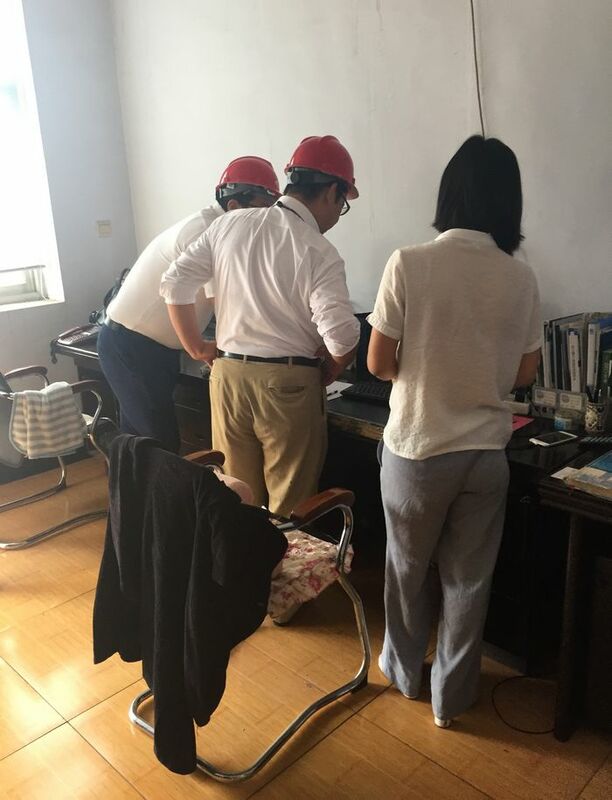 We test many times after finish the production, to avoid any nonconformity points. DC Oil tanks have been exported to over 60 countries and area with their good quality solid control equipment/ waste management equipment, countries like America, Brazil, Chile, Venezuala, Kuwait, Iran, Iraq, Saudi Arabia, Oman, Israel, Australia, New Zealand, Mongolia etc. The decanter centrifuge produced by DC Machinery are horizontally positioned centrifuges with a solid wall drum (therefore also called solid wall screw centrifuges). The drum is cylindrical-conical, it consists of a longer cylindrical part (the so-called clarifying zone) and of a conical part (the so-called dry zone). The material to be processed is fed via a so-called feed tube into the drum, where, due to the centrifugal force the solid material particles sediment on the drum wall. Decanters (decanter centrifuges) are “solid material oriented” centrifuges which can process liquids / suspensions with high solid material contents (up to ca. 60% by volume). Separation of 3-phase mixtures (two fluid phases, insoluble in each other, and a solid material phase) etc. 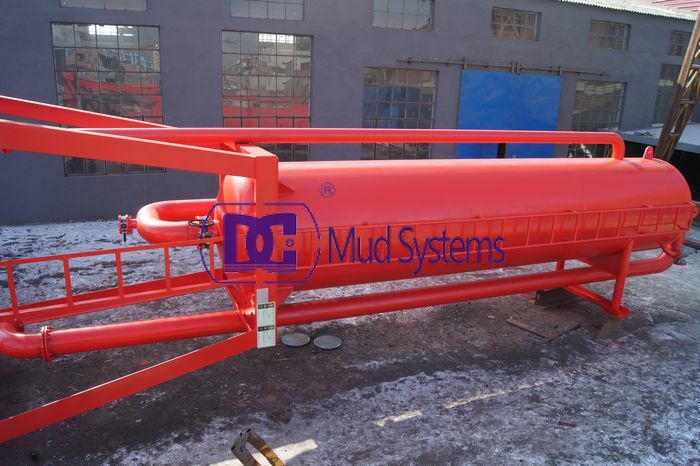 DC Mud gas separator offers the highest gas-and liquid handing capacity available. Its highly efficient baffling system maximizes mud gas separation, enabling operators to drill deeper, large-diameter wells and exploratory wells at higher circulating rates while safely handling greater volumes of gas. It also minimizes mist carry over and gas-cut mud at the flow line. 1. Main body diameter are 600, 800, 1000 and 1200mm which can allows the highest gas- and liquid handling capacity available. 2. Optomizes safety and control. The mud gas separator unit enhances safe drilling practices during underbalanced conditions, improves” kick” handling capabilities, permits optimum circulation rates and large-diameter holes to the drilled through the targeted zone. 3. High efficiency baffle system. Maximizes mud gas separation, minimizas mist carryover which produces a cleaner flare and minimizes gas-cut mud at the flow line. 4. Capable pressured operation. Increases gas-and liquid handling capacities and permits immediate sale of gas during drilling operations. 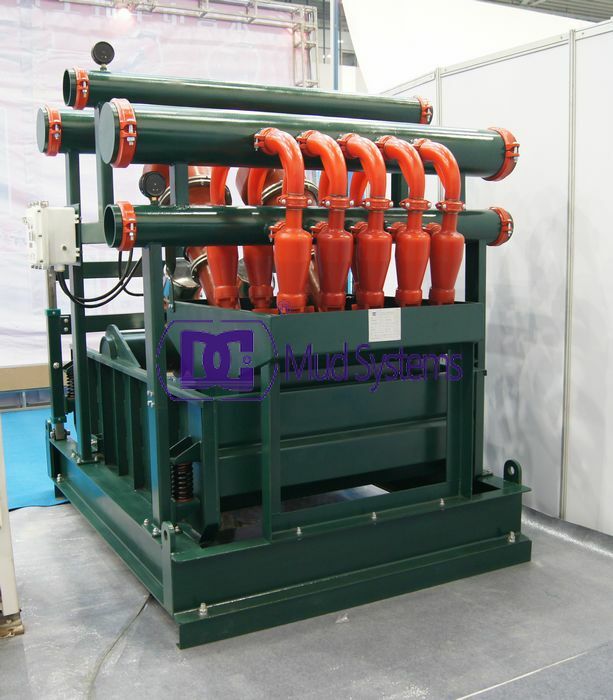 DC use high quality steel materials manufacturing normal pressure prevent H2S Mud Gas Separator,can effectively prevent the harmful gas erosion, ensure the man- machine safety production. DCQJ250x2/100×10 Mud cleaner is one of the most hot sale model of mud cleaner equipment whose flow is about 240m3/h. At present DC Solid control has a finished mud cleaner at a big discount sale can meet your urgently requirements. 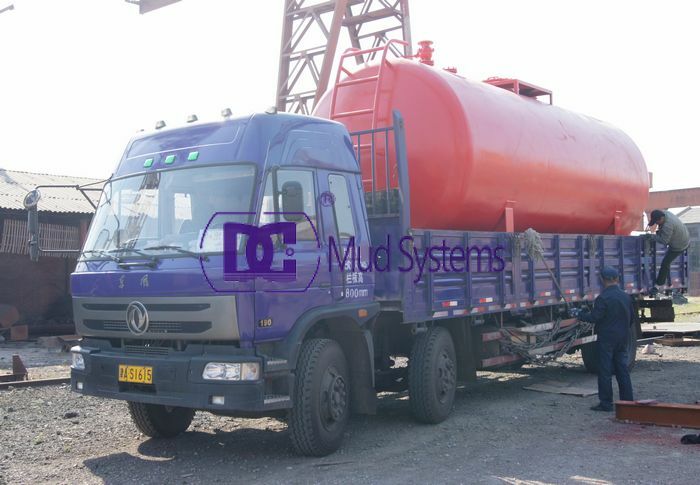 DC Mud Cleaner completes consist of everything you need to plumb up to and operate the equipment as it own stand alone unit. Just select the Mud Cleaner and Shaker combination you need based off of the flow rate you need to process and what micron level you need to cut to. The unique manifold design minimizes the pressure drop across the hydrocyclones, thereby maximising solids removal and reducing the volume of mud discharged with the captured solids from the cone. If you need to retain a larger capacity we are more than capable of constructing and fitting the equipment on any size mud cleaner you need. 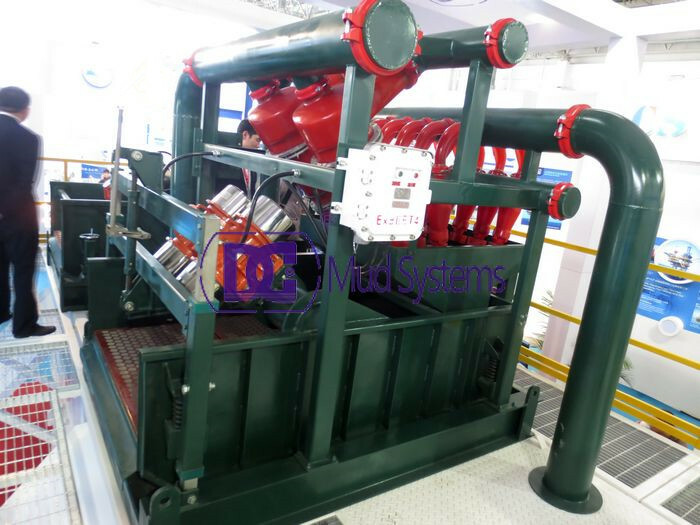 Mud system, basically drilling mud tank system, is a combination solids control equipment that is connected among mud flow lines configured on mud tanks. It aims to clean, recycle, mix and condition the drilling fluids in desired properties as per the drilling formation requirements. Each project is different, that is why we don’t apply one-fit-all approach. We would analyse the project requirement and give the tailor designed proposal. From equipment configuration, tank design to electric control system, we always deliver the most satisfaction to our clients. Shaker screen is an important and quick wear parts of shale shakers, whose working effect can direct influence the follow-up.DC Machinery manufactures high performance shale shaker screens which are designed to handle large liquid flow rate capacity, plugging & blinding resistance, durable & long lasting construction at an economical price. DC Machinery supplies all the popular shale shaker screen on market, which are classified into 4 categories: Steel Frame Shale Shaker Screen, Pyramid Shale Shaker Screen, Hook Strip Flat Screen and Hook Strip Soft Screen. Following is an salable one introduction in our company. 1. To arrange these Steel Frame Shaker Screen layers reasonably and exactly,the screening effect will become better. 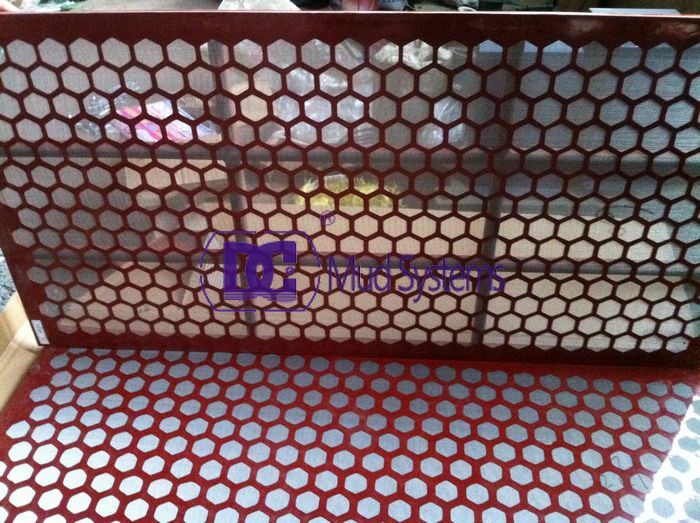 shaker screen is enhanced largely in strength, service lifetime and flow of drilling fluid that the product can bear. 3. The mesh numbers of the furnished screen meshes are different. Through combining the screen meshes correctly and appropriately, the screening effect can be improved greatly. 4. The screen mesh is divided into a number of small independent meshes to avoid local damage and excessive expansion. Meanwhile, the special rubber is available for repairing damage, which can save time and reduce using cost. 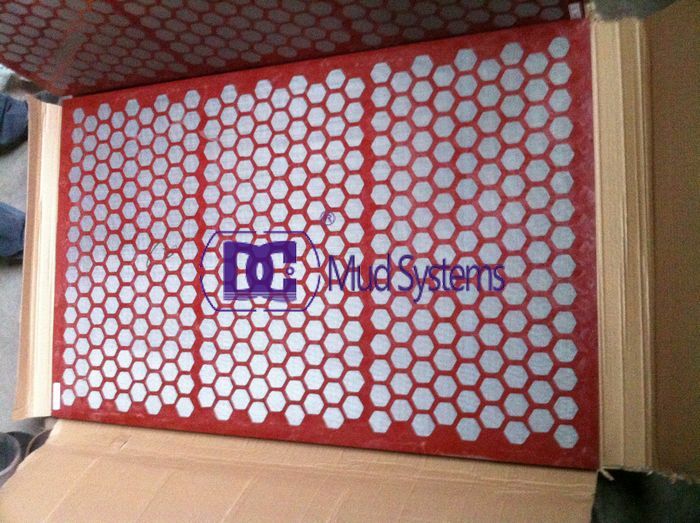 DC’s shale shaker screens meet all the international standards with a cheaper price. 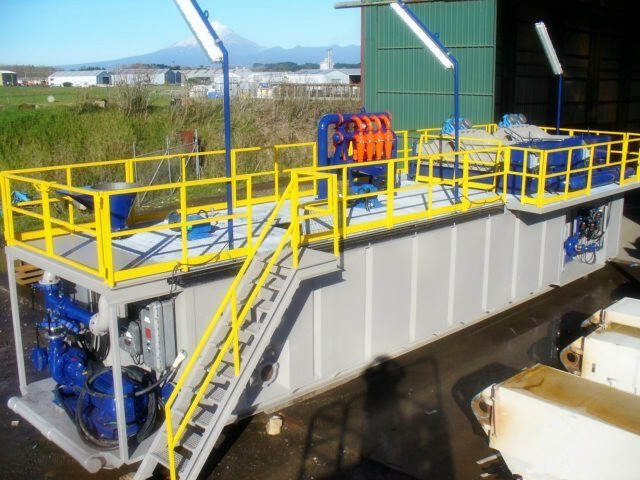 Contact us today to learn more about how our shaker screens can improve your shaker performance and drilling fluid recycling. 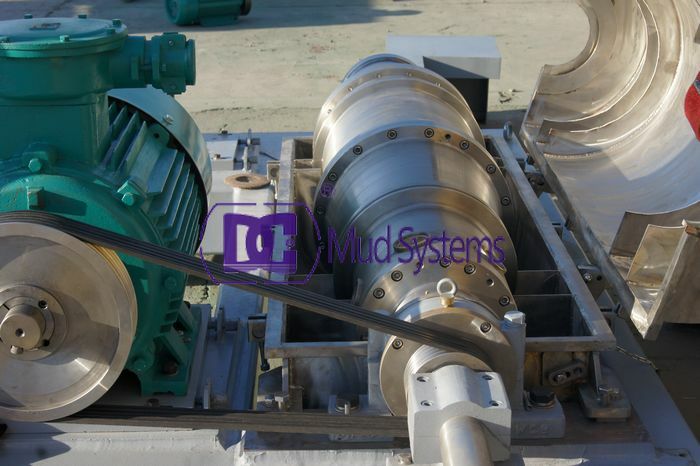 Mud cleaner is the second or third stage separation equipment of drilling liquid, which deals with the mud after being treated by the first grade separation equipment. The barite will be recovered and cuttings which are bigger than barite will be removed. Then the barite in the underflow will flow into circulation tanks through the screens when the weighted mud passes while the particles that are bigger than mesh will be removed. DC Machinery used at home and abroad the most advanced mud cleaner production process, to ensure that the production of powerful, compact structure, convenient operation, easy maintenance of drilling fluid mud cleaner. 3. feeder box with inlet connection locates on back 10″,1MPa flange. 4. Desander cones are 10″ or 12″ hydraulic cones and manifold which are made of high-chromium iron while desiter cones are 4″ or 5″ hydraulic cones and manifold of polyurethane. perform operation independently according to site situations. 6. Convenient dismantlement and transportation of two parts. 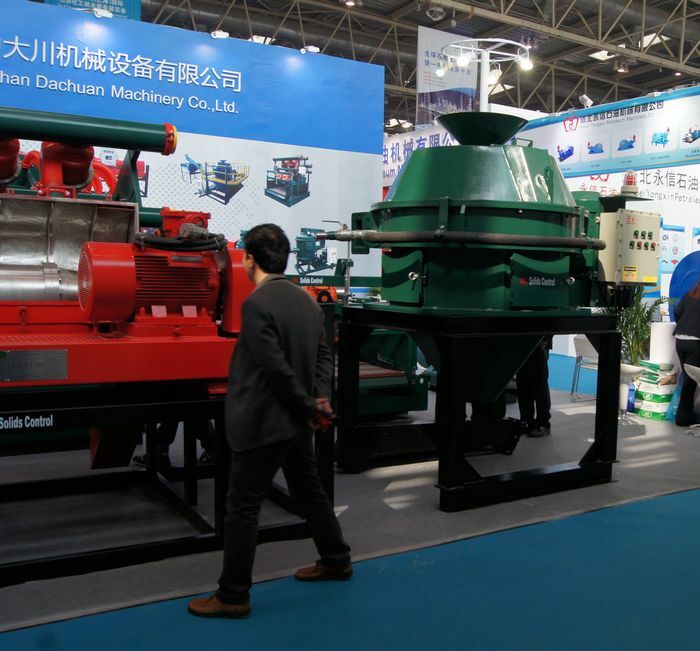 You are welcome to call Dachuan Machinery to get more info about the mud cleaner and we are appreciated to supply the cost-effective products and service for you. Today, our new clients who are come from Singapore to visit DC factory to discuss the cooperation issue. They want to change their drilling mud system and mud tanks. The clients look at the draw detaily and provide their special request. 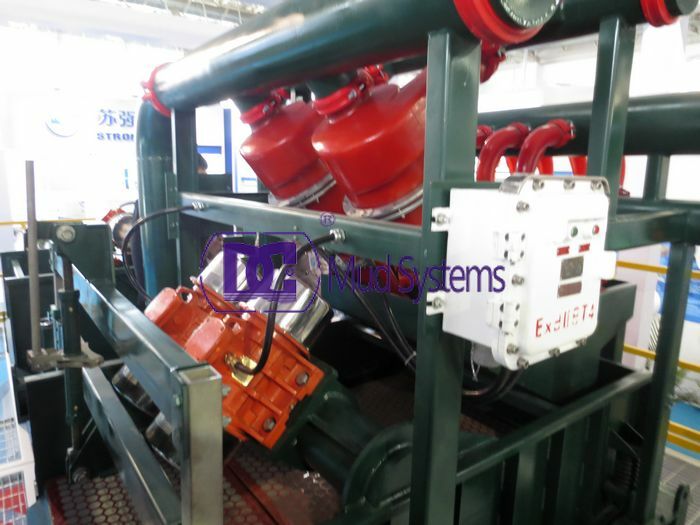 The clients ordered the ZJ50 drilling fluid system according to 3 hours technological exchange. 2. Mud mixing and dosing system. 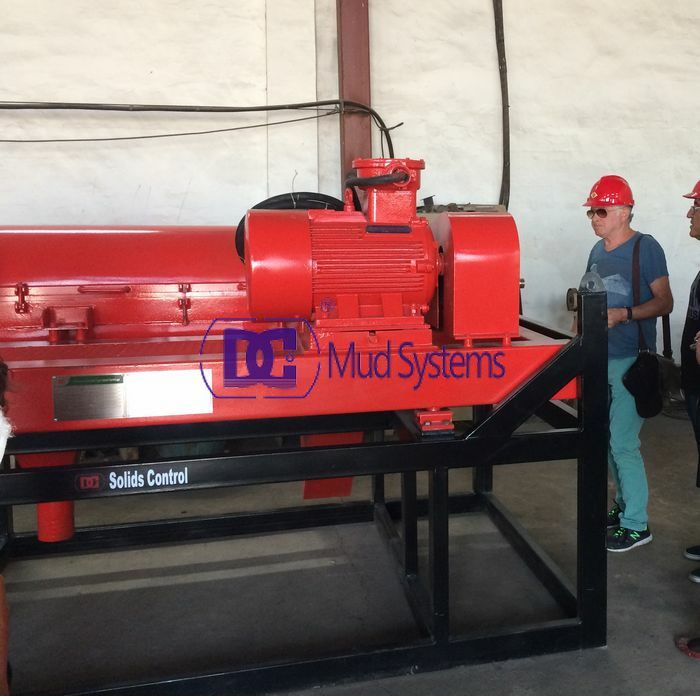 DC Solid control will start to manufacturing the mud system next week and will have administration of executive personnel living in our factory to see each process of manufacturing. Please follow my blog if you want to know more detail manufacturing issues. 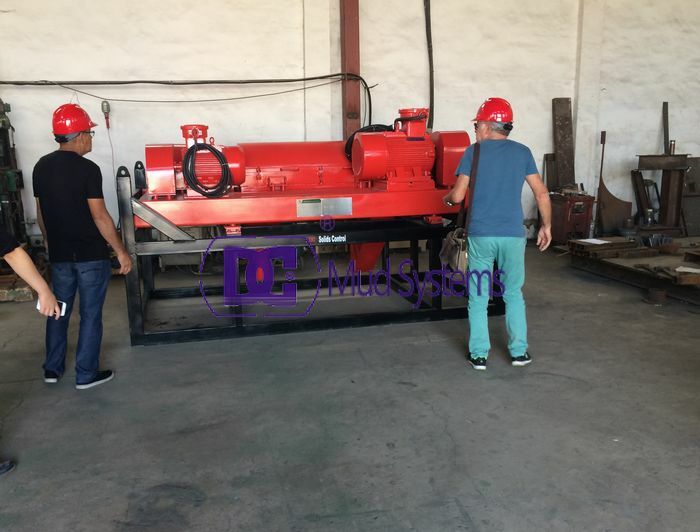 Today, Saudi Arabia clients checked the decanter centrifuge which they ordered DCLW450-1258N. This type of decanter is specialized in waste water processed industry. 1 Different working speed can be set according to actual need, thus achieving the purpose of energy saving. 2 Fast dynamic responses and accurate speed difference adjustment can greatly improving the content of dry material in the wastes. 3 Switch between speed and torque is quite convenient , which can improve working efficiency. 4 The device can be used to separate solid particles whose diameter is above 2 microns. 5 Explosion-proof electronic control cabinet adopts explosion-proof fan to cooling and heating tape to deice and defrost. DCLW Series centrifuges not only used in waste water processing industry, but also can be used in drilling fluid circulating system, Chemical, Food and ect. If you have special request, please feel free to contact us.